The current Vendor Booth Assignments can be seen here: 2018 Vendor Booth Assignments. We are still working to finalize this layout. Contact or call 801-859-5858 with any questions or concerns. The Avenues Street Fair is held annually on the second Saturday of September. This is a celebration planned and hosted by the Greater Avenues Community Council (GACC) to celebrate community. Each year we hold the Fair on a different street to highlight the varied and eclectic architecture of the Avenues area, one of the oldest residential neighborhoods of Salt Lake City. The Fair typically spans five blocks and features live entertainment at each end. Fair attendance is free to all. The Fair features and celebrates local talent and artistry. In addition, local food vendors, various government agencies, non-profit organizations and small businesses take the opportunity to be known in the community. The Street Fair has its origins dating to 1978 when the Avenues Restoration Association began holding house tours, antiques sales, tool exchanges and parties on nearby lawns. Their first t-shirt depicted “God’s finger” (a la Michelangelo) touching the Avenues. Later, as the Fair developed and expanded, vendors were added, home tours were dropped (the Utah Heritage Foundation now known as Preservation Utah conducts those) and bands such as Joe Mescolino and Brown Baggers donated music. Police provided barriers to close off the streets, neighbors pitched in their garbage cans and electricity, LDS wards offered their restrooms and Bill Spencer at 8th Avenue Market offered good deals on soda and beer. These early events grew in to the Street Fair we know today. Planning for the Fair begins each year months before, in March. Numerous permits are obtained from the City and County; booth applications are taken, a featured artist is selected, people’s art is solicited, the children’s parade is planned, the children's activity area is developed, recycle and trash bins, water and porta-potties and street signs are ordered; neighbors are contacted; bands are solicited to play music, all by teams of volunteers. It is truly an event that brings people together and builds community. Today the Street Fair remains a celebration of our homes, our art, our partnerships, and our neighborhood. The Street Fair is an all-volunteer event. The committee consists of anyone with an interest in having a fun time putting a fair together. Meetings to organize the event are held beginning in March. All the GACC Board members pitch in and help in many ways, but numerous volunteers come for several hours to help set up, take down or run a booth for the GACC. 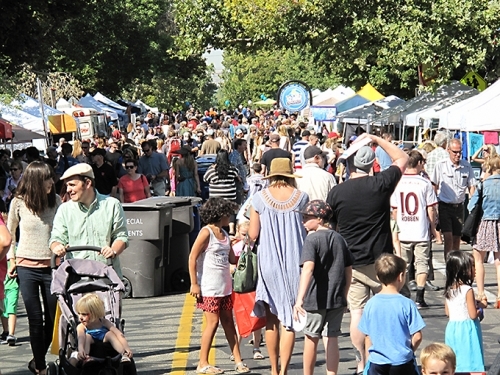 Contact the Street Fair Chair at if you are interested in becoming involved or click here https://avenuesstreetfair.org/participate.